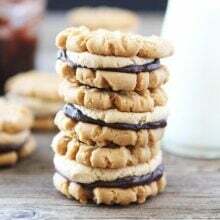 Flourless Peanut Butter Chocolate Ganache Sandwich Cookies-flourless peanut butter cookies filled chocolate ganache and a creamy peanut butter filling. Tomorrow is National Peanut Butter Lover’s Day, pretty much the best day ever! I am going to celebrate ALL day long. I am kicking off the day with Baked Peanut Butter Apple Oatmeal, for lunch I will enjoy a simple Peanut Butter, Banana, and Honey Sandwich, and for dinner I will eat Cucumber Noodles with Peanut Sauce. Wait, you think I am done? NO WAY! Dessert is a MUST on National Peanut Butter Day! 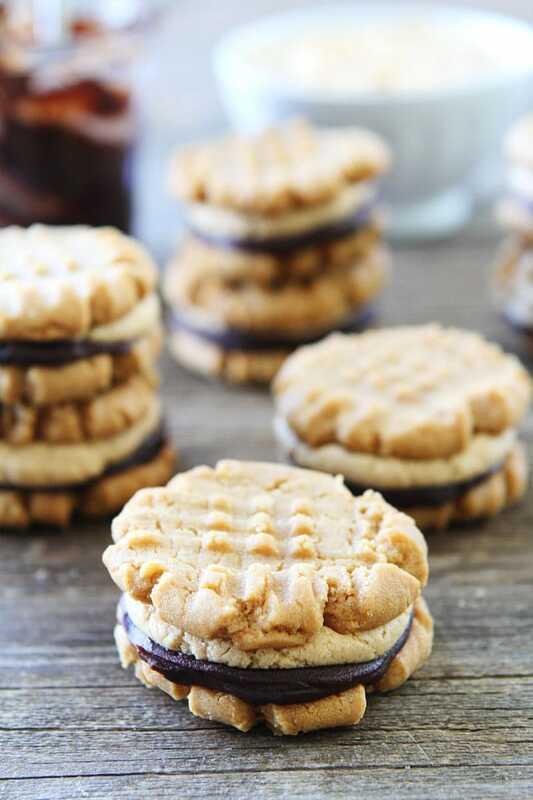 I am going to make Flourless Peanut Butter Chocolate Ganache Sandwich Cookies. A mouthful, right? You just wait until you try them! Your mouth will be VERY happy! 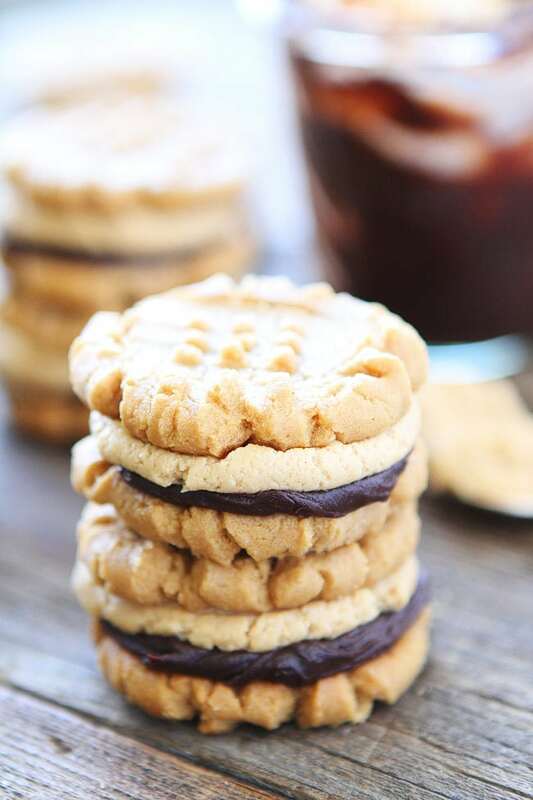 Peanut butter cookies are delicious on their own, but add chocolate ganache and a creamy peanut butter filling and you have a HEAVENLY peanut butter cookie! You might even shed a tear, these cookies are that good! The peanut butter cookies are flourless. That’s right, no flour is needed. They are gluten-free and SO easy to make. Once the cookies are baked and cooled, the real fun begins. I take a cookie and spread silky chocolate ganache on the bottom. Next, I add a layer of creamy, dreamy peanut butter frosting. Put another peanut butter cookie on top, slightly press together, and VOILA…cookie heaven! 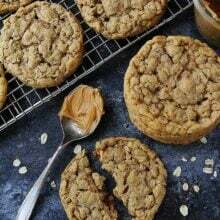 The peanut butter cookies are thick, slightly crispy, and go so well with the chocolate ganache and peanut butter filling. Peanut butter and chocolate together equals extreme happiness! 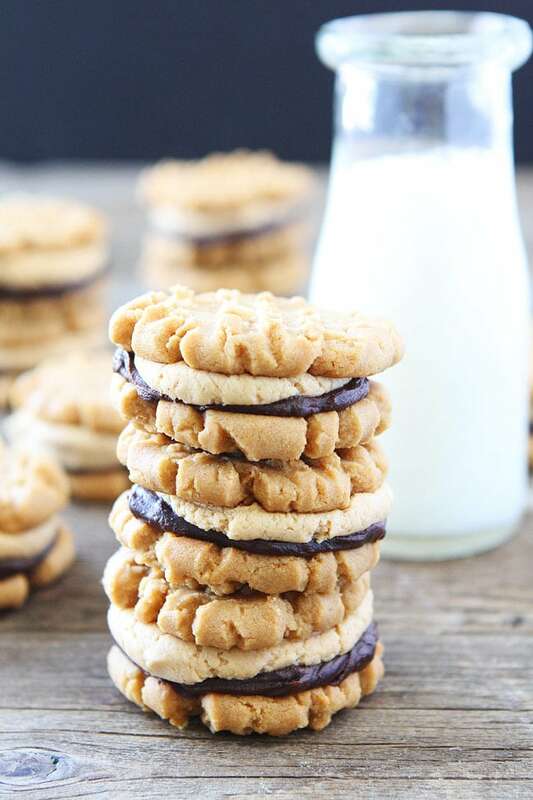 Make sure you have a glass of cold milk nearby because you will need it to wash down these peanut butter sandwich cookies. 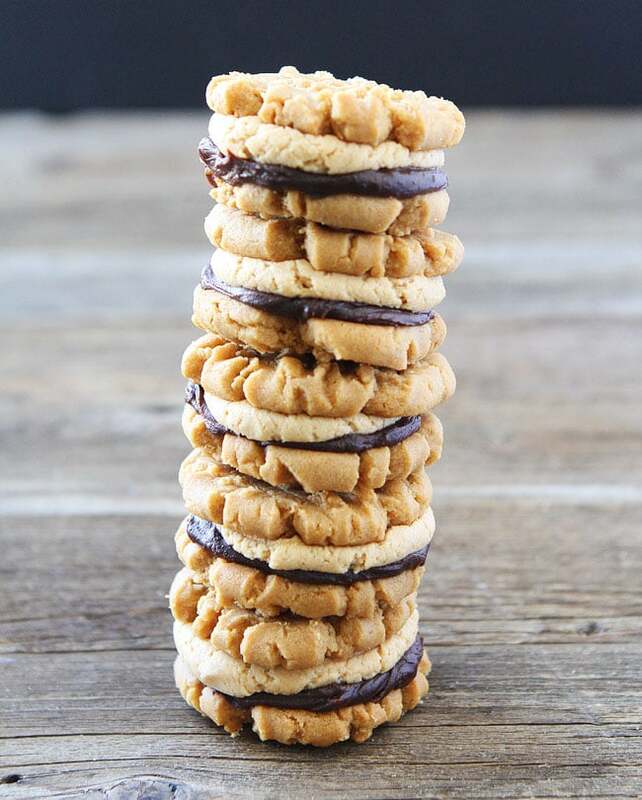 Celebrate National Peanut Butter Lover’s Day with me tomorrow and make Flourless Peanut Butter Chocolate Ganache Sandwich Cookies. They are the perfect peanut butter cookies! And if you can’t wait until tomorrow, I completely understand. You have my permission to get the party started NOW! 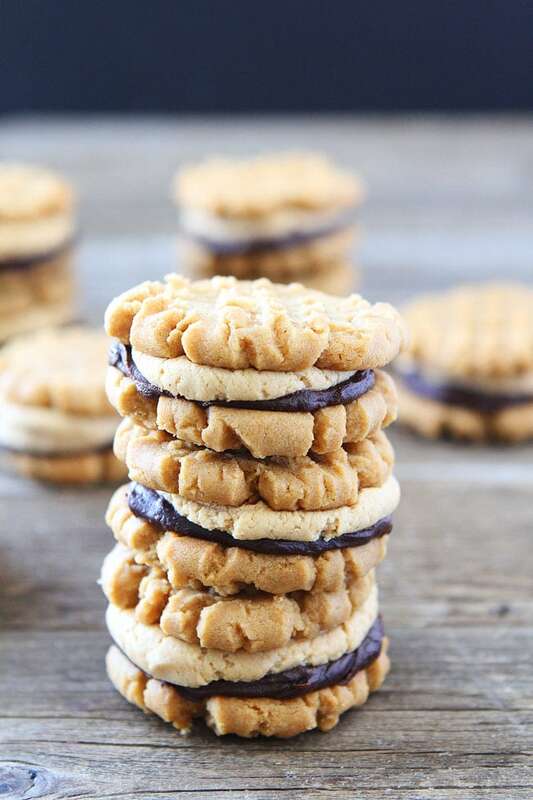 The chocolate ganache and creamy peanut butter filling makes these peanut butter cookies extra special! Preheat the oven to 350 degrees. Line a large baking sheet with a Silpat baking mat. Set aside. In the bowl of a stand mixer, mix the peanut butter and sugars together until creamy and smooth, about 2-3 minutes. Add the egg, vanilla, and mix until combined. Add the baking soda and salt and mix until combined. Spoon dough into balls, about 1 tablespoon of dough for each cookie. Place them on the prepared baking sheets, about 2 inches apart. Smash dough balls with a fork, creating a criss cross. Bake for 8-10 minutes. Don't overbake. Remove cookies from oven and let them sit on the baking sheet for 2 minutes. Move to a wire rack and cool completely. While the cookies are cooling, make the chocolate ganache. Place the chocolate chips in a medium bowl. Heat the cream in the microwave, in an microwave safe bowl, for 30-60 seconds, or until cream is hot, but not bubbling. Pour hot cream over chocolate chips and let sit for 1 minute. Stir until the chocolate melts and you have a smooth and silky ganache. Set aside. To assemble the sandwich cookies, take one cookie and spread ganache on the inside of the cookie, about 1 1/2 teaspoons. Next, either spread on the peanut butter frosting with a spoon or put the frosting in a pastry bag and pipe the frosting onto the ganache. I like to pipe the frosting. I use about 1 tablespoon of frosting. Top with another cookie and gently squeeze so the ganache and frosting meet the edge of the cookies. Continue until all of your cookies are sandwiched! Note-these cookies will keep in an airtight container on the counter for 2-3 days. I agree – National Peanut Butter Day is the best! And these cookies look like a perfect way to celebrate! 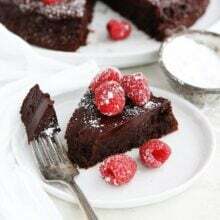 For the ganache, would using almond or coconut milk work instead of the heavy cream? I haven’t tried anything but heavy cream to make ganache. Let me know if it works! 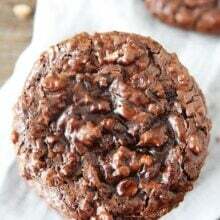 This is making me CRAVE pb chocolate cookies right now!!! I love the ganache sandwiched in the middle!! Chocolate ganache AND peanut butter frosting?! YES! these look amazing! Maria! 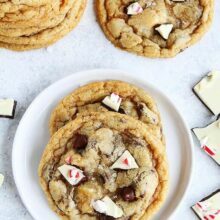 These cookies sound A-M-A-Z-I-N-G!! What a great , easy way to get a pb & chocolate fix. The best way to cure your craving! Does it matter if you use natural peanut butter or the creamy peanut butter that has been emulsified? You can use either, just make sure the peanut butter is well stirred. Wow, wishing I had these gorgeous cookies for breakfast!! Love!! Cookie heaven indeed! I should make these for my family soon! 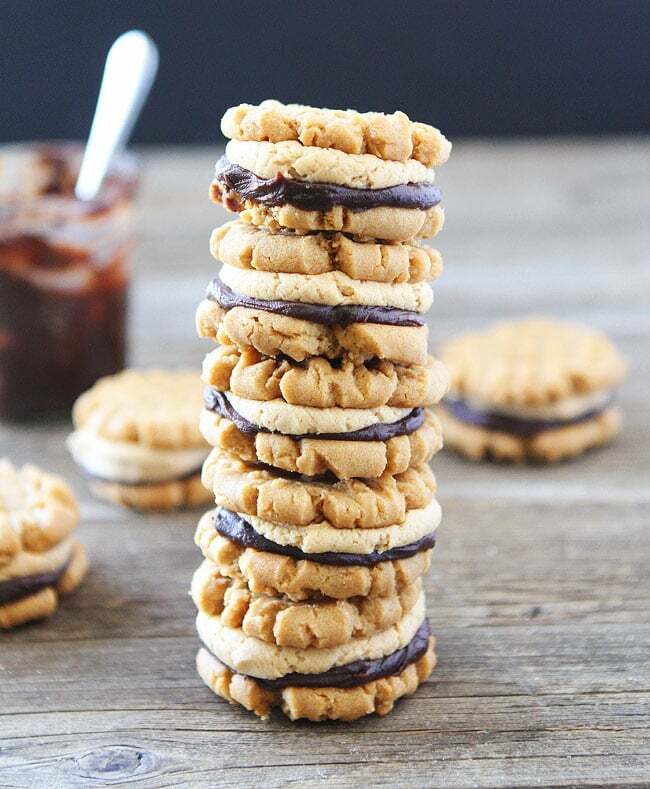 So many of my favorite words together: flourless, peanut butter, chocolate, ganache, cookies? Total yum!! These just look divine! Send some of these cookies to Telluride please! If i wanted to make some of these ahead of time and freeze – do you think it’d work? Or freeze pieces separately? I would probably make and freeze the cookies and then make the ganache and frosting the day I want to serve them! Did you use natural peanut butter or “regular” peanut butter for your recipe? I see you said you could use either….but when I use natural, the only kind I buy, the cookies tend to be crumbly 🙁 My GF daughter who is no longer DF will LOVE these!!! Thank you! I don’t have a Silpat baking mat…not even sure what it is. Can I still make these? It is a silicone baking mat. If you don’t have one, you can still make the cookies. Use parchment paper! Please be aware, not all powered sugar is GF. Check the lable to make sure it does not contain wheat starch. I just threw together a batch of these and they are EVERYTHING!!!!! Peanut butter cookies were born for this. THANK YOU!!! P.S. my wife is allergic to egg yolks, so I subbed two egg whites + 1T ground flax seed. It’s fantastic! I’m making these for a baby shower and did a test run. The cookies spread to what appears to be twice the size of yours from the pictures. I want to go for the smaller cookie, like yours. Do you think chilling the dough would help this? Thanks for the great recipe — they tasted amazing! Chilling the dough should help. You can also make them smaller. I made these tonight. They were so good that I had to make another batch. Delicious!! I do think that a double batch of cookies and a single batch of ganache and filling would work well. My cookies were not flat at all and I did not refrigerate them. Thanks for your terrific recipes! These look phenomenal! Can’t wait to make them with the kiddos as a Happy Mother’s Day to me treat! I made your recipe and the cookies taste so yummy but they crumble to pieces. Can you suggest what I may do next time? These are the BEST peanut butter cookies EVER! Everyone who eats them- loves them. Not only are they gluten free but I tweekwd them with Earth Balance butter for the filling and almond milk to make the ganache- making them lactose and gluten free- but most of all DELICIOUS! I made these for a friend and she loved them! My official taste tester (my husband) also approved of them. I personally don’t eat peanut butter in desserts, but I strongly considered it with these cookies. Thanks for the recipe! Hi.. One question, when these cookies are filed and left for a few hours will they get soggy with the filling? Just made these cookies. They turned out beautifully, even with the substitute of 2% milk for the cream in the ganache (all I had). My two kids and I all declared them the very best cookies we’ve ever had:). Thanks for a great recipe! I have made these in the past for a family member who suffers from celiac disease and they were great! He tolerated them just fine. I will be making them again this weekend. Can you use natural peanut butter in this recipe? I wonder if they’d come out as yummy if I reduce the amount of sugar? I just made these as I love finding a good thick chewy PB cookie recipe. They are amazingly delicious as I expected. My question is that my cookies seemed to spread more than yours and are thinner with less definition in the fork markings. I would prefer thicker and more definition and wondered if you had any suggestions? Not sure how flat you actually made them when you put the imprints in with the forks? Not sure if that makes a difference? Just wondering if you had any ideas or had any similar issues when testing these. Thanks so much! Can the cookies be frozen after dyeing fully assembled? These look INCREDIBLE! Super excited to make them! I saw your comment about leaving them on the counter for 2-3 days. If I was to keep them in the fridge after a few days, do you think they’d last through the week? Yes, they should keep fine in the fridge. Enjoy! This was a great recipe!! No changes made and it was perfect. Cookies by themselves are great if you just want the cookie. Crazy good – so yummy & easy to make too! Caution: I used a large scoop which made seven complete sets. Way too big for portion control but wow, what an amazing cookie – definitely a keeper in my cookie stash. Thank you.